(8) Wave/Window Management: Some times I wished I could easily, quickly open another wave to check a quick reference, but still continue to work on a wave without closing it. (9) Interactive drag and drop of image files: Now many people will upload their 5 MiByte large original photos directly into the wave. Probably not what everybody wants or expects. (I personally like to resize images before making them available publicly.) Would be great to be able to set a max size! I think Picasa let’s you do that when exporting to your online album. (10) Groups and Public Waves: One standard functionality for handling groups and public waves would be great. (11) Display: Even though Wave floats and is (thanks to Google God) not a fixed width application scrolls bars should appear when the window is resized to too small dimensions. (12) Additional options for robots: Some robots like aunt-rosie@appspot.com should only get activated on a blip by blip basis. (13) Search Panel: Wouldn’t it be great to access previously saved searches directly from the search panel without having to go over to the navigation panel. The navigation panel is often minimized. (14) Automatic Searches / Filters: In a discussion with another user of Wave, I just thought filters or automatic searches would enhance the functionality a lot. Similar to filters in Gmail. I guess I do not need to explain more details. (15) Some Bad Keyboard Shortcuts: Learning those couple of keyboard shortcuts for Wave really gets you up to speed. There are still some quirks like the system not updating the user interface quickly enough. Especially when it comes to status info in lists. Things like read/unread, is it still in the inbox or nor, did it move to that folder, etc.? However there is especially one keyboard shortcut which is simply annoying. <Shift+Enter> it can start a reply or commit a reply/edit. The bad taste of it comes from the use in many, many other editors in which <Shift+Enter> just inserts a line break <br /> instead of a paragraph break. Used to that I very often still get it wrong. (16) Missing scroll bars: The Wave web application floats which is great and simply means that it is not designed for a specific screen size. Usability experts love that fact. But what one needs to do in case the window gets too small is to add scroll bars. This applies for windows as a whole and for embedded windows and frames. Google suppresses those which leads to some states in the user interface which lock you up. (17) Tags / Folders / Labels: Right now these are implemented as follows. Tags: One set of tags identical for all users. Folders: Set by each individual user. An indicator which folder a wave belongs to is missing in the wave panel itself. This would be very helpful. Labels: Not implemented, yet. But Gmail can serve as a great example. Since tags are shared among all participants in the wave and a wave can only belong to one folder, I think it would be very helpful to organize waves especially for public waves. (18) Groups waves delivered into inbox: When someone writes a wave to a group it doesn’t show up automatically in the inbox of the group members. They have to search for it with:thisgroup@googlegroups.com to reveal new waves. Only group waves that are already followed will pop up in the inbox. What about a feature/setting that delivers group waves into the inbox? (19) Search options for date and date range. (20) Templates: I miss real templates in Gmail, and I miss them in Wave. A template could be complex. Already contain more than 1 blip, embedded blips, list of participants, robots — and some robots could already be configured. The template remains unpublished until it has been published. The publishing process could be as follows. Select a template which means a copy is created as an unpublished draft. Imagine you need to update the footer or header on your website, blog, in your e-commerce store. It’s easy, isn’t it. All you need to do is to update a single header or footer file, a template. Now let me translate this to Wave. You can use special variables in documents or templates. The variables are configured and represented via a robot for example. The settings/variables can be defined on various levels. Example Use case: Need to update a link in the footer of a lot of templates. Currently one can copy a single blip to a new wave. Child blips are ignored and won’t be copied as well. 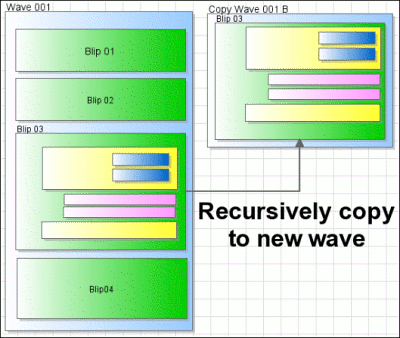 Being able to copy blips recursively could be very beneficial in certain setups. Imagine you are preparing a complex document for being published as Wave. Before actually adding other participants and publishing the Wave one may decide to “flatten” (delete) the previous history that leads up to that point. I just added a private reply to a wave by accident. Just caught the wrong menu entry. Too bad I cannot delete it even though it is empty. File the wave into folder X. Wave will be removed from inbox and put into folder X. Move the Wave to the inbox. Wave will be moved to inbox, but assignment to folder is deleted. I will have to put the wave back into its folder manually again. will put the wave back into the inbox, but — as it should be —the wave remains assigned to the folder it was filed in. Meaning the wave resides in two folders simultaneously. As opposed to the cases in cases 1.1. and 1.2. Case 1.1. and 1.2. relate to physical folders (only one at a time), whereas case 2 behaves more like ordinary labeling. (26) Playback starting where you are: The major issue with playback: It starts at step 1 all the time. Even if I have 237 steps and only wish to review 230-237. There should be an option for getting into playback mode at the current time line for easily and quickly going backwards. This probably should be the default option. Eventually an input field for numeric positioning could be helpful, too. (27) Inline images and attached images: Many people know that one can drag and drop images from other desktop applications directly into a Wave. The client then generates a thumbnail image and the original image is hosted at Google as part of the Wave. It looks like this example on the right side. You can click on the image (not in this blog post only in Wave!) and it will enlarge in the same window. Actually open a slideshow viewer for all images in the same wave. On the other hand you can embed images directly into the text. There are at least two problems associated with this approach. No formatting options for this image. I only can change its size. The image is hosted at the original URL from where it has been copied into the wave. This functionality needs to be improved. Leave your comment here or in the discussion on Wave (requires a Google Wave account). 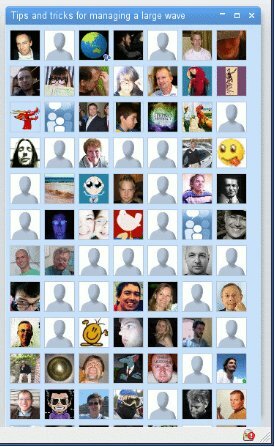 I also have prepared another post where I talk more about the actual experience of using Google Wave.